In this tutorial we will look into Absynth powerful oscillators. In Absynth these are not only standard oscillators but they are advanced audio generators with wide variety of different synthesis and modulation techniques. In combination with advanced modulation capabilities of Absynth they offer some truly amazing sound design possibilities which cannot be found in any other synth. Absynth has three identical main oscillators for producing tones in the very top of each module slot of Absynth, channels A, B and C.
Oscillators in Absynth have some very unique and unusual features worth exploring. We will look into few simple examples first. Enable Oscillator in channel A first. You do that by clicking name tab on the left edge of the module. Below the oscillator you can see two empty slots (for filter and one for audio modulation effect) and then horizontal slider which represent the loudness level of that particular channel. First parameter in the Main Osc panel is the Synthesis drop down menu, which defines the type of synthesis performed for the main oscillator. We will look into them a bit later. The second parameter is Waveform Selector and is available for all oscillator modes based on a wavetable. It allows you to choose the Waveforms for the oscillators in Absynth, everything from standard ones like sine, triangle, saw to many other more exotic ones. – Simple Waves are single cycle Waveforms that are read from a wavetable. – Morph Waves are Waveforms that use the function Wave Morph which we will look into a bit later. The third parameter is tuning parameter. You can specify the frequency of the oscillator in various ways. – Trans: The oscillator follows the pitch of the played note. The Frequency control determines the transposition in semitones. – Ratio: Transposes the oscillator according to a frequency ratio. This mode is especially useful when using frequency modulation and ring modulation. In the second two modes oscillator ignores the pitch of the note played. – Hz: You can specify the fixed frequency of oscillator in Hertz. – Fixed pitch corresponding to a selectable MIDI note. Lets try out some of the waveforms. Draw some simple midi note sequence, I have used simple arpeggio to give the sound some motion. Lets select few different waveforms from the Simple Waves menu for Osc A. Now lets fatten the oscillator using the unision and detune. Go to the Uni panel of the oscillator. Lets first raise Voices parameter number to 4 so each note played will produce 4 voices by this particular oscillator. You can hear the sound gets fatter and more pronounced. Now with Trans parameter you can detune each additional voice in semitones. Set it to 0.0500. Even-numbered additional voices are transposed downwards,odd-numbered voices upwards. So in our case this will detune second voice for 1/20 of a semitone down, the third voice for 1/20 of a semitone up and the fourth voice for 2/20 or for 0.1500 of a semitone down again. If we would add another voice, so the total would be five voices, this would detune this fifth voice by 2/20 up again. With random parameter you can control the amount of random detuning for all of the voices to emulate the unstable tuning of analogue oscillators or to produce natural variation in tone for percussion sounds or to bring up some tension in string and pad sounds. One parameter we haven’t covered in the Main panel of the oscillator is Phase. The parameter has no audible effect when oscillator is in 1 voice mode. But now we can try it out. Setting the Phase Sync switch to Phase will reset the phase of the oscillator with every incoming MIDI note. If you set the oscillator to free mode which means there will be no reset with every new note played. You can hear the quite notable effect it has on the sound. 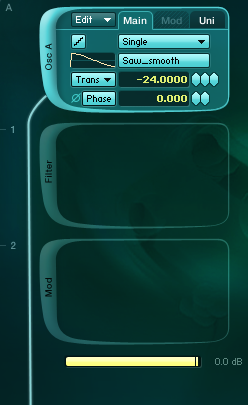 First two bars are with phase reset on then second two bars with phase reset off (Free mode). With Phase parameter value you control the starting point from which the waveform is being scanned. This starting point is the same for all the voices of a single operator so the effect is not audible yet because there is no second oscillator present. Now lets try various oscillators synthesis modes. You will see that even with a single oscillator with no filter and modulation we can produce some quite exciting timbres. In Double mode, a pair of oscillators consisting of the Main oscillator and the Mod oscillator are active. The signals of the two oscillators are mixed together. You can see there is now active also Mod panel of the oscillator. Here you control the frequency, phase and waveform of the second oscillator. The Balance parameter controls the amount of mixture for the second oscillator. So at balance set to 0 there will be no second oscillator present in the output signal and with mixture of 100 there will be only Mod oscillator heard. Set Trans parameter of the Mod oscillator to 12 so I twill play one octave higher than the midi note played. Set balance to 0.500 so we will hear both oscillators in equal amount and also set waveform of Mod Osc to Saw_real. Ok, now we can use the phase parameter. This is a very subtle effect, but can be very important in low frequency sounds such as bass and kick. Lets move to the next Oscillator synthesis mode. Absynth also offers FM based oscillators. Set oscillator in FM mode and waveform of Main oscillator to sine. Now the main oscillator acts as a carrier and the Mod oscillator acts as a modulator which means it modulates the frequency of the Main oscillator in audio rate. This produces sidebands in sound which results in additional and more complex harmonic content of the Main oscillator waveform. The amount with which Mod oscillator modulates the Main oscillator is set with FM index parameter. Note that we always hear only Main oscillator and the frequency modulation effect that Mod oscillator has on it. Set Mod oscillator also to sine waveform and turn transpose parameter to -12. Now slowly start raising the FM index parameter from zero to the fullest amount. You can hear some interesting timbres are produced. Set operator to ring modulation mode. Ring modulation is simply multiplication of two audio signals. In this case it multiplies the signal of Main and Mod oscillators. The Balance parameter controls the mix between unaffected Main oscillator sound (at a value of 0) and between ring-modulated waveform of Main oscillator. Note that changing the phase of the Main oscillator has a great effect on overall sound. Ring modulation is great for producing enharmonic and noisy timbres. Here is a sine wave Main osc ring modulated by a saw wave Mod osc. And then with some more unusual waveform. The next two Oscillators mode are something very special. 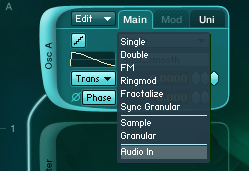 In Fractalize mode, the selected Waveform is copied to itself in different ways. 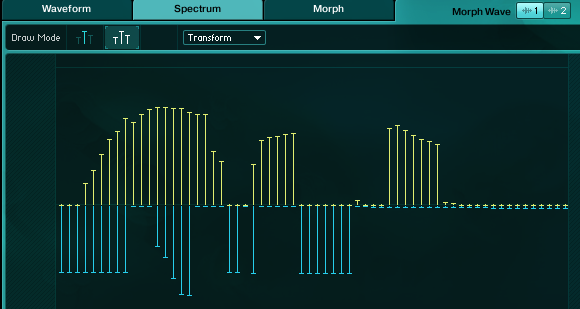 You can use the Fractalize mode to add overtones to a plain Waveform like sine wave. Here you can hear sine waveform oscillator in fractalize mode. As you can hear this is a very complex waveform without any resemblance to sine wave. With this Iteration parameter you can choose the number of similar repetitions that you want of the same sound. Higher values lead to more complex, lighter-sounding sounds. With Amount parameter you can define the mix between the original waveform and its copies. With Displace parameter you can define the shift of the copied area relatively to the original Waveform. If you modulate this parameter with an LFO or an Envelope, interesting movements inside the sound will result. Here is an example again with sine wave and automated Displace parameter. This mode divides a Waveform into small grains and then brings these parts back together. This process Is called re-synthesis. You can change the frequency of the grains, change the Density control value to determine how individual grains overlap, and use the parameter Scatter to manipulate the level of diffusion of the grain cloud. Balance controls the mix between Main Osc A waveform and re-synthesized version of the same waveform. This oscillator mode is great basis for producing all kinds of pads, drones and noises. Here is an example of unprocessed and unmodulated Sync granular oscillator. Absynth oscillators are also able to morph between two different waveforms. This is great feature with many different uses. Everything from subtle variation of tone to fast glitchy effects. 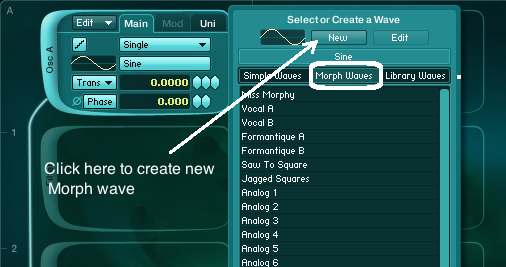 To use morph wave we must first load it into oscillator. We do that by selecting a Wave model from the Morph Waves in the Waveform Selector of any oscillator that uses waveform. Click on the New button. This creates a new waveform that uses the selected waveform as it’s model and Absynth opens the Wave Window automatically. In the morph page of the Wave window you can fade between these two waveforms. Here is the simple morph example with single oscillator in fractalize mode. First we hear quite simple tone which is then morphed into almost organ like timbre. For more extreme effects we could use some different oscillator types such as Ring modulation oscillator, FM based, Granular and then morph their waveforms. Here are few examples with modulated pitch and wave morph of a ring modulation oscillator. Every wavetable waveform in the Absynth can be edited via the Waveform tab of the Wave page in Absynth. You can draw your own waveforms, perform different operations on them, such as filtering, inverting the phase, fractalize etc. You do that by choosing operation you want to perform on your wave from the Transform drop down menu. Also in the spectrum page of the Wave Window displays you can graphicaly edit waveforms’ first 64 harmonics. The top half of the display shows the harmonics’ amplitude, the lower half their phase. This offers great creative potential however his is a such a vast topic so we will explore it in detail in future tutorials. For now maybe try to get used to various oscillator types we have explored in this tutorial. Experiment with different waveforms in combination with different oscillator modes. 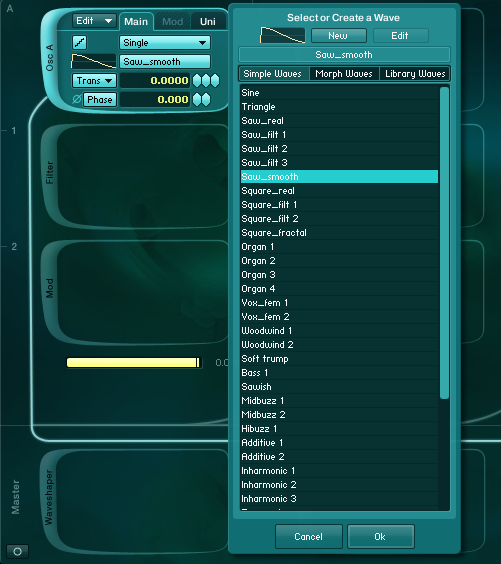 Absynth also has some interesting sampling capabilities which we will also look into in future tutorial. If you have any questions or comments feel free to leave the below.